Imagine ... The beginning of the 20th century, a small village in the south of Uruguay. Two farmers are trying to relax after a hard day's work. They have a deck of cards handy. They make up the basic principles canasta, little realizing that their game will in the future be popular all over the world. Believe it or not, this is a true story really happened – and thus was born one of the classic card games. It is played in many parts of the globe, and with greatest passion in South American countries. The very name of canasta comes from the Spanish language, and its simple translation is “basket”. It has this name from the goal of the game, which is for the players to collect defined combinations of cards. Canasta moved quite quickly from Uruguay to Argentina, and after the Second World War gained fans in the United States. Interestingly, compared to other games such as poker or thousand, the rules of canasta, have not changed much over the years, except for changes in the melds and the number of cards. 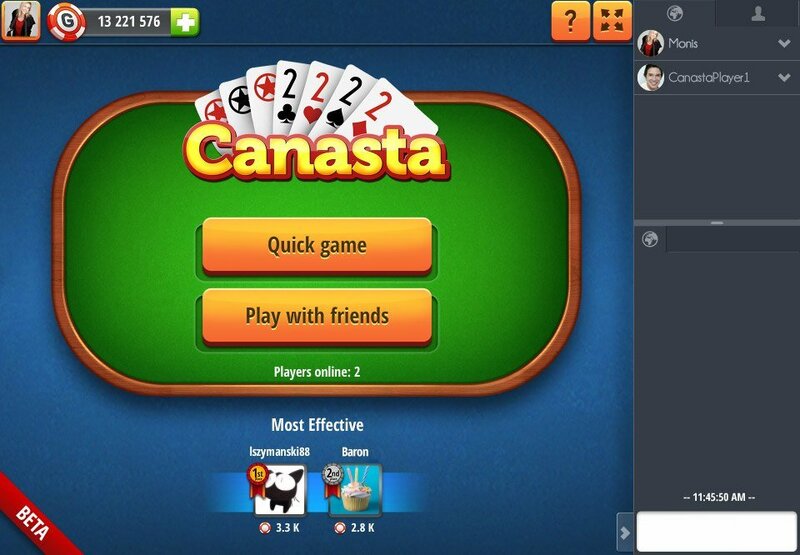 Of convenience for every canasta fan is the availability of games on the internet. 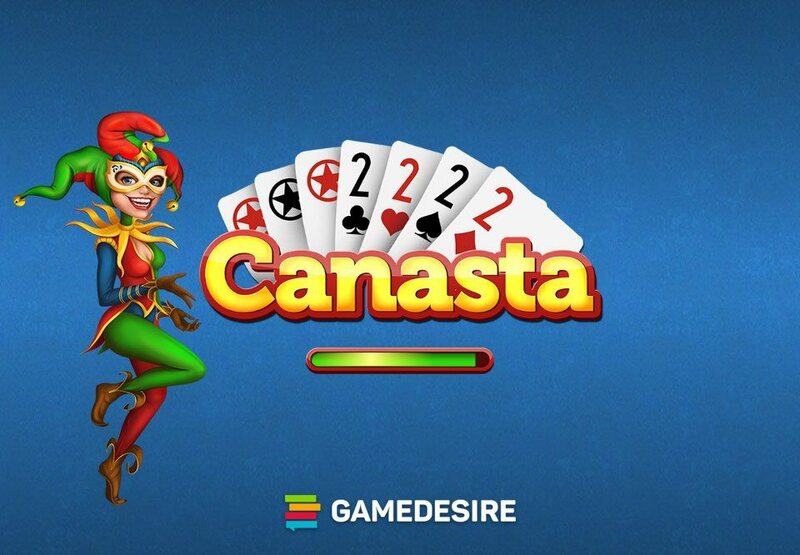 You need only to register on the portal GameDesire, a process that takes less than five minutes, in order to join the hundreds of canasta fans waiting for you at the table to play. The rules of canasta resemble to a great extent those of other card games, especially rummy, so mastering them is not usually overly difficult. However, there are some rules that are found only in canasta, and you should know these before playing. The game begins with each participant being dealt a hand of 15 cards (if the game is played more than three people, they are dealt 13 cards). The remainder are placed face down on a separate stack, so that their values cannot be seen. The top card of the stack is then turned up, and placed to begin a second pile, called the discard. 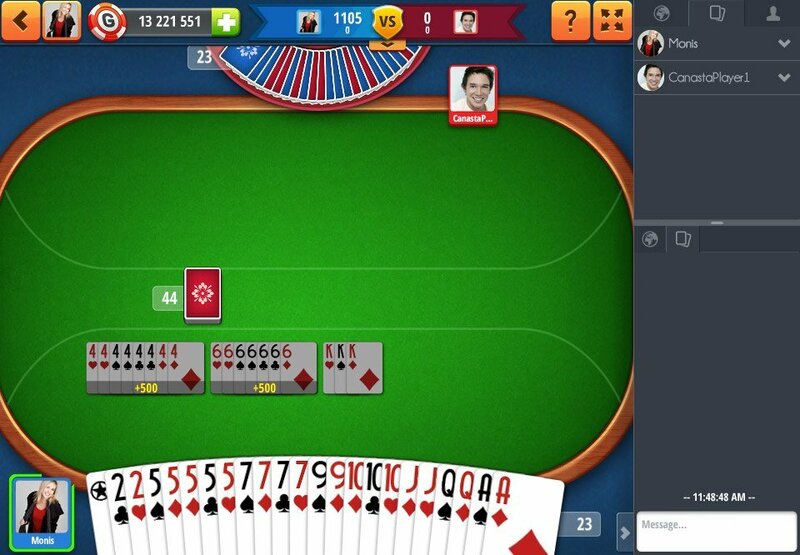 Combinations known as melds are the key to winning in online canasta. A meld is a minimum of three cards of the same value, for example Q ♠ Q ♣ Q ♥. The aim of the game is to get rid of your cards and gain 5 000 points from melds, canastas and red threes. During the game, you can also lose points if you do not get rid of your cards before rivals. The game consists of a few hands. In canasta there are what are commonly known as wild cards, which are twos and jokers. These can replace any other card. However, the melds of each player must contain a minimum of two natural cards, which should always outnumber the wild cards. Therefore, melds consisting only of twos and jokers are not allowed, with the exception of wild canastas. A good meld in canasta online would be, for example, two aces, of hearts and spades, and a joker. If your meld contains more than seven cards, then it is called a canasta. For this, a player receives bonus points. A canasta with natural cards is scored higher than a canasta with a mix of wild cards. However, the highest number of points are awarded for a wild canasta, a meld of seven wild cards, which must be played in one move. 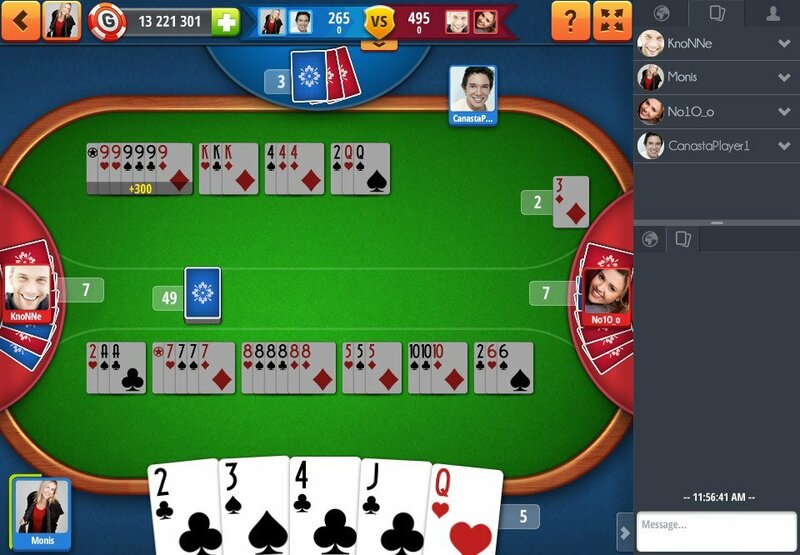 A hand in online canasta ends at the moment when one of the players gets rid of all their cards, or when the stack of face down cards runs out. The winner is the person who has gained 5,000 points or more. The points position is taken into account after the completion of the deal, not during it. If several people have the same points, the result is a draw. The first move after shuffling and dealing the cards must be taken by the player to the dealer’s left, who draws a card from the stack (or the discard pile), with the option of picking up three cards of the same value. The same player then drops one card onto the discard pile. If the player draws from the stack a red three they must set it aside and take another card. If a red three is drawn from the discard pile, it is not exchanged for another card. Bonus points are awarded for the red three at the end of the hand. By contrast, black threes can be melded only last, and with no wild cards. With simple rules, a little calculation, luck of the cards and addictive action, this game can provide real card game excitement for the beginner and advanced player alike, around the clock. Now it's your turn to play canasta online!